If you are looking for a place to stay in the New Forest and would like to experience unusual accommodation, then choosing to stay on a boat in Lymington is something you must consider. Lymington is a beautiful Georgian market town on the southern edge of the New Forest. Situated between Southampton and Bournemouth and at the western end of the Solent it offers a unique place to stay – especially if you are on a boat. With its accessibility from London by road and rail, Lymington has become one of the Southern UK’s holiday hotspots. The high street features a number of independent shops and designer boutiques. Every Saturday the high street plays host to a fantastic street market. It’s origins allegedly to date back to the 13th century. A cobbled street gives access to the picturesque old town quay where there are further shops, pubs, restaurants and chandlers. The bustling quay is also used by visiting yachtsmen and is a base for the town’s fishing boats. You can visit lymington.com to find out more including what’s on and what’s great about Lymington. Lymington is surrounded by stunning scenery featuring areas of outstanding natural beauty and historic landmarks; to the north are the ancient woodlands and heathlands of the New Forest. Once a former hunting ground of Kings, now boasting miles of bridle paths, walkways and cycle tracks. To the south, the Solent and Isle of Wight provide a spectacular backdrop. This includes miles of coastal nature reserve ending at the Castle on Hurst Spit – a site that has special scientific interest. Hurst Castle, a fort built by Henry VIII to protect against the invaders sailing up the Solent, also became a prison for Charles I prior to his execution. The new forest has an excellent choice of places to stay. From award winning country house hotels, quirky B&B accommodation to self catering hideaways, you’ll find something that will suit you and your budget. And now, there’s a new way to stay with Beds on Board. Look beyond the more traditional types of accommodation and stay on a boat in Lymington. With prices from as little as £50 per person, staying on a boat is an affordable option and certainly one that compares to staying in hotels or B&B’s. Lymington’s 2 principle marina’s are Lymington Yacht Haven and Berthon Marina. Both marinas are positioned amidst the stunning backdrop of the Solent. Each has spectacular views yet are just a short walk from the town. The marina’s have fantastic facilities for boat owners and visitors alike including shops, chandlers and their respective restaurants The Haven Bar & Bistro and The Shipyard Restaurant & Bar. 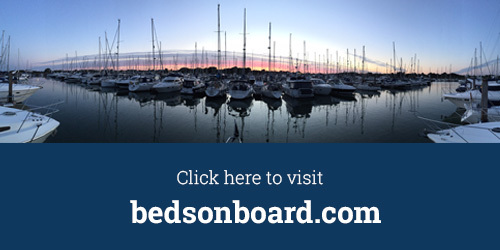 Visit bedsonboard.com and start searching for a unique place to stay today.